XO has great news for Punta Gorda chocolate lovers who want to improve their health as they enjoy their chocolate. Brunswick companies have been responsible for important scientific and medical breakthroughs for almost 60 years. Since 1997, Brunswick Laboratories has led the way in quantifying the antioxidant capacity of foods, physiological fluids and other health-related substances. 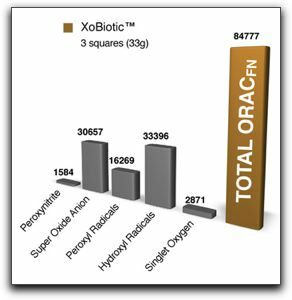 Working closely with the USDA, we have improved and validated a method called ORAC (Oxygen Radical Absorbance Capacity) as a standard for measuring antioxidant power. At present, ORAC is the commercial method of choice in the food and nutrition industries. Brunswick Laboratories’ innovations will continue to help clarify the relationship between nutrition, environment and disease. It is important to note that Brunswick is not affiliated in any way with Well Beyond Corp, the manufacturer of XO healthy dark chocolate products. It’s Okay To Give Your Hubby Dark Chocolate To Keep HIs Heart Healthy~ Heart Healthy Chocolates For Your HusbandThe test results for XoBiotic are in! We knew that the new formulation would have an incredibly high ORACFN value, but we had no idea just how high! This is my favorite product of all! XO’s XoBiotic packs an antioxidant punch and satisfies the most discriminating chocolate connoisseur. I am Lynette Henk. I share XoBiotic cold pressed chocolate with people in Port Charlotte, Punta Gorda and North Port. My current customers are eager to try the new XoBiotic and all the other Third Generation XO products. If you would like more information about XO antioxidant chocolate, contact me at 941-216-5727, at [email protected] or at ColdPressedChocolate.com. I will post the test results for the other XO re-formulations as they become available. XO chocolate is truly healthy; and we have the science to prove it. PreviousWhat is A High CRP Level And Why Does It Matter in Punta Gorda? Can Not Find Nuggets in Sakai Japan?